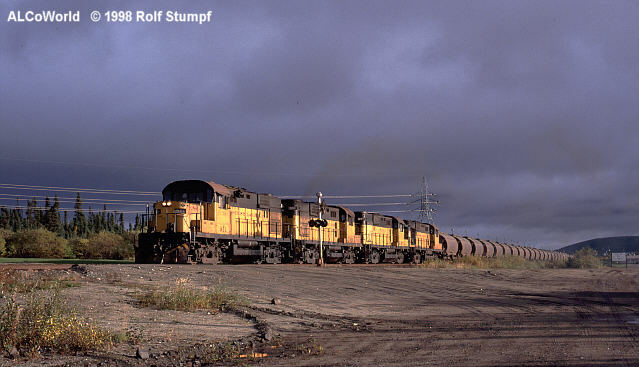 A loaded train waits to enter the pelletizer plant at Pointe Noire, September 13th, 1998. RS-18s 906, 902, 905 and 904. Arnaud 906, Pointe Noire, September 13th, 1998. The Wabush Lake Railway in the north (or in the deep interior of the Canadian Shield) also employs four units on the trains. From the distance I saw single RS-18 for the switching in the Wabush mine. The line to Ross Bay Junction from where the Quebec, Northshore and Labrador RR takes over for the trip south offers excellent locations, esp. along the lakes. In the entrance area of the Wabush mine one can get the trains moving in and out. The QNSL traffic makes waiting for the Wabush trains a lot easier though I had to wait "my loaded" train out for more than 5 hours. Finally, at 1 am it came! The lights of Labrador City illuminated the exhaust from the back - fantastic and recommended! 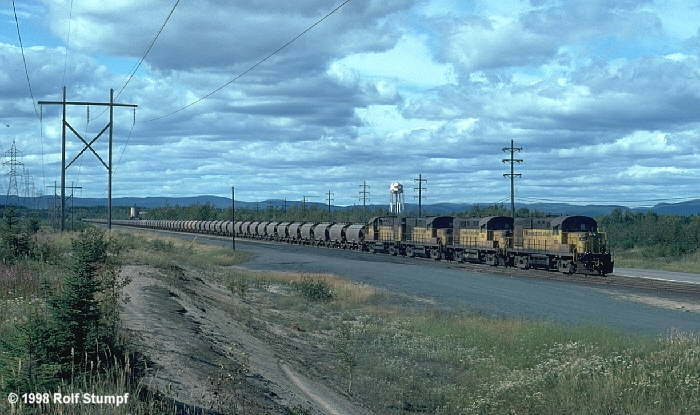 Four Wabush Lake Railway RS-18 enter the ore plant at Wabush, Labrador with an empty ore train. September 22nd, 1998.